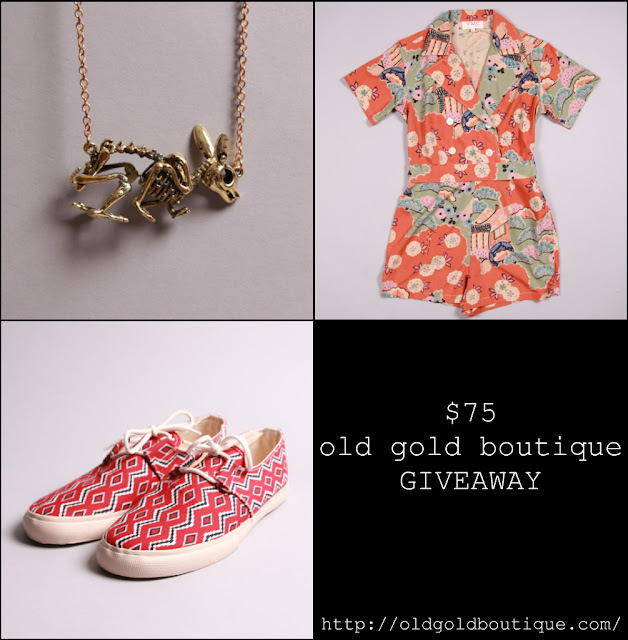 devorelebeaumonstre.com | Pittsburgh, PA | Fashion & Personal Style Blog by Stacey Belko: old gold boutique giveaway. This week's incredibly generous giveaway is for a $75 giftcard to Old Gold Boutique. What I'm loving most about this giveaway is that not only can my lady reader's enter but since they have men's clothing my guy reader's can enter too! & $75 can go a long way! Check out Old Gold Boutique HERE. EXTRA ENTRIES if you follow me on twitter HERE or Old Gold Boutique on twitter HERE or 'like' them on Facebook HERE. Giveaway will be open until Tuesday, May 17th & a winner will be selected using random.org. p.s. The winner of the Paola Loves To Shop giveaway is Sara. Congrats! and i follow you on twitter (@carlijnmossink) and i follow Old Gold Boutique on twitter. Hi, thanks for the giveaway!!! I follow you through blogger and bloglovin', but I don't hace twitter. that romper is AWESOME!!! fingers crossed. ooooo i love old gold! Love it! I follow with GFC and my email is ofhorsefeathers@gmail.com. Funny note... the Eastland brand is located very near me. I'm always pleased when things from Maine actually get out in the world. i like the accessories the most and the bath and body . I'm following you on Bloglovin'. LOVE your blog, and their stuff is gorgeous! i love old gold boutique! i love their skeleton necklaces like the bunny one up there.. Thanks for the comment on my blog. You took my blog comment cherry. You're my first (feel special, there can only be one..). Leopardtuxedo @ gmail.com feel free to email when I win. I need that necklace. Wow! Love the bird cage tree earrings! I follow you, and "like" OLDgOLD on FB! I just posted this shoes on my blog. they are awesome! Follow you on gfc and twitter. Did we have to do separate comments for each entry? Sorry if not! Amazing give away! I didn't knew this webshop before, but Gold Boutique has such great items. btw, I've also likes Gold Boutique on FB! Just found your blog! Love it. FOllowing and liked OGB on fb! & I just started following old gold on twitter! Great give-a-way they have awesome stuff! Giiiirrrrl. Following via bloglovin. Nice give-away! Follow via GFC and Bloglovin. Follow you and Old Gold Boutique on Twitter as @monikaretnani. Like them on Facebook as Monika Lintang Retnani. love this giveaway. follow your blog with bloglovin and google. i love your style. thanks for the chance to win. Im in for this giveaway! J adore!!! Surtout ce collier!!! the necklace ... ♥ ! ooh enter me! love that romper! I follow on all and their stuff is so nice! you are darling and so is this give away! Super cool! Thanks for checking out my blog! i looked through your most recent posts and i love all yr jewelery. great giveaway! I must try! 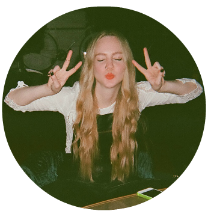 I follow you on bloglovin and with gfc. your blog is awesome! thanks for letting me know about this giveaway! Thanks for linking me to this giveaway on my blog. Gorgeous posts and love all your images-your hair is awesome. Anyway following on everything,looking forward to more posts, and love this giveaway! very nice giveaway and your blog is just stunning! Great giveaway :) I'm following You through Google and I also like Old Gold Boutique on Facebook. ok i'm following via google and bloglovin! Entering! Already following you, doll. I follow on GFC and adore the YMC Cotton Sheeting Floral Sundress. I follow your blog via Google Friend Connect and Bloglovin'. enter me please, lovely giveaway. i follow your twitter, i'm elnrsmith. Hey it's layinshambles, thanks for sharing this info with me. I love the blog, and will continue to follow. Hiya, thanks for the warning. Done everything even the exxxtra's, their collection is gorgeous!